BBC SPORT | Football | Euro 2004 | England | How does Rooney match up? How does Rooney match up? Wayne Rooney continues to knock down the records as fast they are put in front of him. England's youngest cap and youngest goalscorer became the youngest player to score in the European Championship finals when he scored against Switzerland. His record lasted just four days before Switzerland's Johann Vonlanthen surpassed him in the record books. Of course there are already some records that have passed him by already - but many more landmarks he can still aspire to. Rooney is too old to take Pele's record as the youngest scorer in the World Cup finals and he could not even beat Michael Owen in that regard - the Liverpool man was 18 years 190 days when he scored for England against Romania in the 1998 finals in France. Neither can Rooney be the youngest World Cup winner, an honour again held by Pele who was 17 when he sparked Brazil to victory in 1958 in Sweden. But if England make the World Cup finals in Germany in two years time, he could become England's youngest World Cup winner, beating another Everton legend Alan Ball, who was 21 back in 1966. Rooney has less than four years to be handed the armband and break Bobby Moore's record of being England's youngest captain at just 22 years 47 days. So records aside, how does Rooney stack up against other England strikers, past and present? Have your say: How does Rooney compare? He has a little way to go yet to catch Sir Bobby Charlton as England's record all-time scorer with 49 goals, a record that has even defeated the likes of Gary Lineker and Alan Shearer. Vince Woodward: 1.26 goals per game. But any doubts about Rooney's importance are dispelled by a goals-per-game ratio that makes him the hottest striker in the England squad. 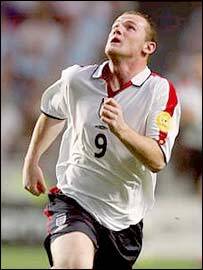 Rooney's nine goals in 16 appearances means he has scored one goal in every 1.7 games, compared with a strike-rate of 2.32 for Owen, 3.3 for Darius Vassell and Emile Heskey, whose strike rate is a goal every 8.6 appearances. But he will also have to find consistency over a longer period to match the true England great scorers. Former Everton man Lineker's 48 goals in 80 games gives him a strike-rate of 1.66, and Greaves' rate of 1.29 is thanks to a record of 44 goals in 57 England appearances. 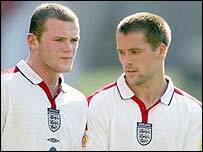 Rooney is unlikely to join the select band who have scored more international goals than their total of appearances. As an Evertonian, perhaps Rooney would not want to emulate Dixie Dean, who scored 18 goals in 16 appearances. In his day, Steve Bloomer was a teenage star, if less hyped than Rooney is now. Comparisons between players of different eras are always difficult, but what does not lie is Bloomer's record of 28 goals in 23 international appearances. That is bettered only by Vince 'Jack' Woodward of Spurs and Chelsea, who scored 29 goals in 23 appearances for England. It seems almost sacriligious to cast any aspersions on Rooney, but his domestic goalscoring record is not the best. Last season he scored nine Premiership goals for Everton, while notching six for England. You would never accuse Rooney of saving his best for England, but he is starting to gain something of a reputation of being a scorer of great goals, rather than being a great goalscorer, and his CV would not be harmed by a few scuffed tap-ins. Rooney collected more yellow cards for Everton last season than goals and while he has shown few signs of a hair-trigger temper while playing for England, there is always the fear of a booking or two. England coach Sven-Goran Eriksson had enough faith in Rooney to play him against Croatia - even though one more yellow card would have ruled him out of any quarter-final - and the youngster kept his temper and his nerve to score the goals to get England through. The disciplinary slate is wiped clean now the group stages are over but Eriksson will still be wary of his young pup's potentially hot-headed nature. Starting with Alan Mullery in 1968, only nine players have been sent off playing for England. Rooney would not want to be the 10th and youngest.